If you're looking to buy a top-spec 2010 Terrain, you may want to wait until partway through the model year, as a high-end Denali version is expected soon. Despite similarities to the Chevy Equinox, the 2010 GMC Terrain stands on its own as a boldly styled, efficient, and high-featured small/mid-size crossover. 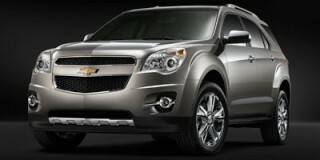 TheCarConnection.com's editors have driven the 2010 GMC Terrain in order to give you their expert opinion. 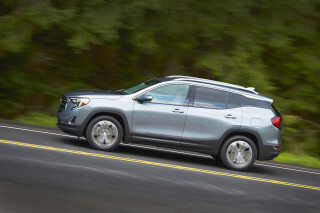 TheCarConnection.com's experts also researched the best GMC Terrain road tests from other sources to produce a comprehensive review, all to help you get the most complete picture of this sport-luxury SUV. The all-new 2010 GMC Terrain shares much with the Chevrolet Equinox, but between a slightly higher base specification and more dramatic exterior styling, it makes a strong case for its own identity. Starting from $24,250 for the front-wheel-drive base model and ranging up to an asking price of $31,000 for the all-wheel-drive SLT-2, the Terrain spans the small-to-midsize crossover space. The styling of the 2010 GMC Terrain is definitely the first thing most people will notice. With big, chunky fenders, a decidedly upright stance, and a tall, broad grille, the Terrain is instantly recognizable, contrasting sharply with the 2010 Chevrolet Equinox's rounded look. It's also a bit polarizing; people either love it or hate it, without much middle ground. Inside, the Terrain is almost indistinguishable from the 2010 Chevrolet Equinox apart from a unique upper dash design and gauge set, but that's not all bad. The interior design is modern and attractive, even if somewhat plain. Digging past the skin-deep changes of the 2010 GMC Terrain, what you find underneath is all Chevrolet Equinox. Sporting a choice of 182-horsepower 2.4-liter inline four-cylinder or 264-horsepower 3.0-liter V-6 direct-injection gasoline engines, the Terrain can be alternately efficient or punchy, but never both. 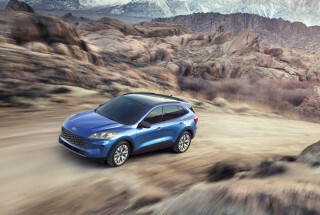 An ECO mode on the four-cylinder model changes the torque converter engagement point for greater efficiency, enabling the 2.4-liter model to rate 22/32 mpg according to the EPA, while the V-6 rates just 17/24 mpg. Towing capacity with the V-6 is better. Which 2010 Terrain engine you choose will affect more than just power and efficiency-the four-cylinder's efficient electric power steering system offers less feel and feedback than the V-6's hydraulic unit. Either way, however, the 2010 GMC Terrain drives like a sedan, but with a secure-feeling higher ride position. Even when towing, the Terrain is a docile, easy-to-drive crossover. Whether you choose durable fabric or the quality-feeling leather, interior build quality and comfort is not an area for complaint in the 2010 Terrain. Front seat passengers will like the wide-open feel of the cockpit and comfortable, mildly bolstered seats. Rear-seat legroom is surprisingly good despite the Terrain's compact dimensions, thanks to a sliding bench arrangement. The slider also allows for more cargo room in the rear when desired, and the folding seats open up for a maximum capacity of 63.9 cubic feet. With the seats up, cargo capacity is still good at 31.6 cubic feet. Unique to the four-cylinder is a special active noise cancellation system that works through both the built-in audio system and a few dedicated speakers to allow the engine to run at its most efficient RPM range while preventing what engineers call a "booming" resonance in the cabin that would otherwise occur. The 2010 Terrain scores very well in crash testing, receiving a full five stars from NHTSA for driver and passenger frontal crash tests and for front- and rear-seat side impact tests. Rollover testing hasn't yet been performed on the 2010 Terrain by NHTSA. The IIHS also rates the 2010 GMC Terrain well, giving it the highest score of "good" in frontal offset and side impact tests, and awarding it a Top Safety Pick designation. A strong feature set for the entry price is one of the other major distinguishing characteristics of the 2010 Terrain from the Chevrolet Equinox. 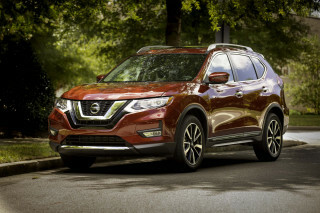 All models come standard with a rear-vision camera, USB connection, keyless entry, XM Radio with three-month trial subscription, two-way power driver's seat with lumbar control, and ambient lighting. Optional upgrades include a touchscreen navigation/infotainment system with 40GB of storage, remote start, leather-wrapped steering wheel with integrated audio controls, Bluetooth connectivity, and a dual-screen 8-inch DVD rear-seat entertainment system. Notable styling inside and out make the 2010 GMC Terrain a definite eye-catcher despite being functionally identical to the Chevrolet Equinox. The styling of the 2010 GMC Terrain is definitely the first thing most people will notice. With big, chunky fenders, a decidedly upright stance, and a tall, broad grille, the Terrain is instantly recognizable, contrasting sharply with the 2010 Chevrolet Equinox's rounded look. It's also a bit polarizing; people either love it or hate it, without much middle ground. Automobile finds the exterior attractive and "sufficiently distinctive" to be safe from confusion with the Equinox, though they do think the large fenders and bold grille "seem contrived to make Terrain appear larger than it is." Edmunds considers the 2010 GMC Terrain's interior "remarkably stylish," especially considering the vehicle's "utilitarian segment." Inside, the Terrain is almost indistinguishable from the 2010 Chevrolet Equinox apart from a unique upper dash design and gauge set, but that's not all bad. The interior design is modern and attractive, even if somewhat plain. Car and Driver praises the "futuristic center-stack controls," though they also note these are shared with the Equinox. They like the red and white light that highlights "cubbies, floor areas, and door pulls" as well. Most 2010 Terrain trim levels feature the same appearance, with Edmunds pointing out the base SLE-1 features "17-inch alloy wheels," which up-size to 18-inch wheels on V-6 SLE-2 models. The SLE-2 upgrade also adds roof rails, while upgrading to the SLT-1 trim brings 18-inch alloy wheels and the SLT-2 package picks up "chrome exterior trim details, [and] a unique grille." Motor Trend says the total package adheres to a "manly theme" that's "not likely to be confused with its platformmate," the Equinox. Edmunds says the "slick-looking dashboard design is reminiscent of the related Cadillac SRX," and despite all the talk of controversy about the Terrain's looks, Jalopnik confesses, "We have to admit to liking it." 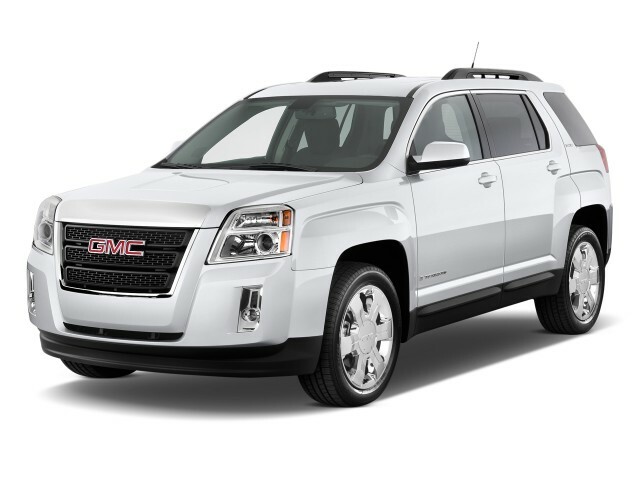 Though it's not a sports car in crossover clothing, the 2010 GMC Terrain is an able companion on the highway, and it's capable of towing decent loads while returning good fuel economy on the daily commute. Digging past the skin-deep changes of the 2010 GMC Terrain, what you find underneath is all Chevrolet Equinox. Sporting a choice of 182-horsepower, 2.4-liter inline four-cylinder or 264-horsepower, 3.0-liter V-6 direct-injection gasoline engines, the Terrain can be alternately efficient or punchy, but never both. A common thread runs through the reviews read by TheCarConnection.com: The four-cylinder is enough for the 2010 GMC Terrain for most purposes. As Automobile puts it, the V-6 adds some punch, but "it's by no means an essential upgrade." That's a reasonable outcome when you consider that Jalopnik hits the nail on the head when it says "there won't be a lot of soccer moms hitting the track with this car." Even so, Motor Trend notes there's "[n]o excessive roll in the corners." Still, this vehicle will be asked to do some tasks that require some guts and gusto, like towing. Towing is where the V-6 comes into its own-as Edmunds notes, the maximum tow rating is "3,500 pounds with the V6." The four-cylinder is only good for up to 1,500 pounds of towing capacity when fitted with the requisite tow package, which is not available at all on the base-model SLE-1. The V-6 isn't a top performer in the class, but it still "hits 60 mph in 8.1 seconds," says Motor Trend. 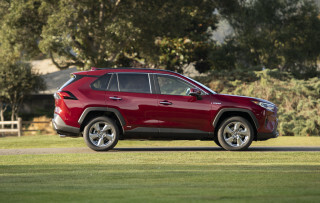 Whichever engine you choose and whether towing or not, Car and Driver notes that all 2010 Terrains have "six-speed automatics that feature a thumb-shifting rocker switch." Both front- and all-wheel-drive powertrains are available, though the "the rear wheels go to work only when necessary," says Automobile. An ECO mode on the four-cylinder model changes the torque converter engagement point for greater efficiency, enabling the 2.4-liter model to rate 22/32 mpg according to the EPA, while the V-6 rates just 17/24 mpg. Automobile describes its function: "an Eco mode button on the console locks the torque converter at 1125 rpm to save gas." Which 2010 Terrain engine you choose will affect more than just power and efficiency-the four-cylinder's efficient electric power steering system offers less feel and feedback than the V-6's hydraulic unit. Either way, however, the 2010 GMC Terrain drives like a sedan, but with a secure-feeling higher ride position. 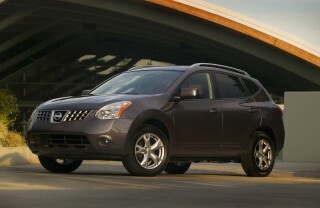 Braking is good, as Motor Trend notes the "Terrain needs 122 feet to come to rest." 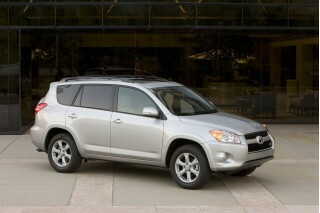 Even when towing, the Terrain is a docile, easy-to-drive crossover. The well-tuned suspension delivers what Automobile calls "a poised highway ride" while also handling rougher pavement with ease. Well-built and comfortable, the Terrain delivers on interior comfort and quality regardless of trim level, though it does have some ergonomic kinks. Whether you choose durable fabric or the quality-feeling leather, interior build quality and comfort is not an area for complaint in the 2010 Terrain. Front seat passengers will like the wide-open feel of the cockpit and comfortable, mildly bolstered seats. Rear-seat legroom is surprisingly good despite the Terrain's compact dimensions, thanks to a sliding bench arrangement. The slider also allows for more cargo room in the rear when desired, and the folding seats open up for a maximum capacity of 63.9 cubic feet. With the seats up, cargo capacity is still good at 31.6 cubic feet. The front seats don't get much attention in the reviews read by TheCarConnection.com, neither inciting hatred, nor exciting most reviewers enough to comment, though Jalopnik does praise the "excellent mid-level cloth seats." Automobile notes that the cabin is available with "two grades of cloth or perforated leather upholstery." Kicking Tires says there's "headroom to spare" even with the optional moonroof. Edmunds finds the "backseat is roomy for this class," and most other reviews agree. Jalopnik points out the "sliding rear seat" makes this possible, delivering what it calls "limo-like leg room." Automobile also praises the rear seat's sliding capability, but observes that the rear seat cushions "don't fold fully flat" when it's time to slide the bench forward and stow cargo. They go on to comment on the "storage areas aplenty" throughout the cabin, and Edmunds asserts that the Terrain is "one of the quietest compact crossovers around," though they also caution buyers to choose the smaller wheels, as the larger options "increase impact harshness." Automobile does pick on the location of the button for making manual gear changes, noting that it's "too far aft for handy reach," and Edmunds warns that "cargo capacity... isn't as generous" as most of the competition. Kicking Tires also marks down the rear seat reclining lever, which they say is "not easily reached once seated." Safety is clearly a top priority with the 2010 Terrain, from its wide range of standard equipment to the IIHS's Top Safety Pick. Standard safety features include anti-lock disc brakes, stability control, and a full complement of airbags with dual-stage frontal and thorax side-impact, driver and front passenger, and protection for head curtain side-impact at both front and rear outboard seating positions. Optional rear parking sensors round out the available safety gear, combining with the standard rearview camera to make it easier to see obstacles behind the vehicle. The display is mounted in the rearview mirror in non-navigation-equipped vehicles. All 2010 GMC Terrains come standard with a PASS-Key III Theft Deterrent System as well. A long standard feature list makes the 2010 Terrain a good buy, but many optional add-ons can push the price upward quickly. A strong feature set for the entry price is one of the other major distinguishing characteristics of the 2010 Terrain from the Chevrolet Equinox. All models come standard with a rear-vision camera, USB connection, keyless entry, XM Radio with three-month trial subscription, two-way power driver's seat with lumbar control, and ambient lighting. Though the 2010 GMC Terrain is, as Car and Driver notes, "roughly $1800 more expensive to start" than the 2010 Chevrolet Equinox, that money does result in a higher level of standard equipment, including fog lamps, tinted glass, a USB port, and a backup-camera display. 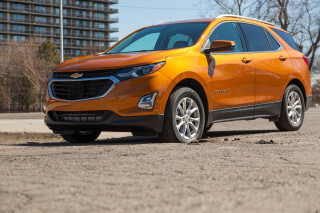 Beyond the base differences, Jalopnik says, "[t]here's no equipment you can get on the Terrain that you can't get on the Equinox." Optional upgrades include a touchscreen navigation/infotainment system with 40GB of storage, remote start, leather-wrapped steering wheel with integrated audio controls, Bluetooth connectivity, and a dual-screen 8-inch DVD rear-seat entertainment system. Despite the long list of standard features and affordable options, the price of the 2010 Terrain can push into the "upper-$30,000 range," says Car and Driver. Car and Driver asserts that, on the whole, options are "quite reasonably priced." Edmunds agrees, noting that the 2010 Terrain "offers just about everything that shoppers in this segment are looking for."